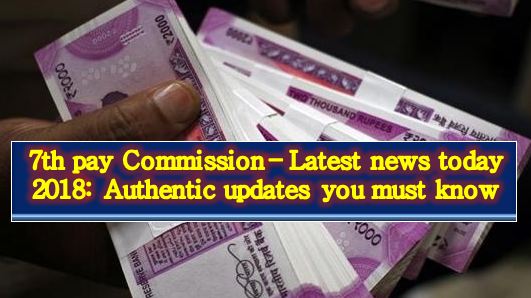 7th pay Commission – Latest news today 2018: Several stories about the implementation of 7th Pay Commission recommendations are doing the rounds on the internet and social media. However, not all of them provide concrete details about the implementation of the recommendations. Much to the disappointment of lakhs of Central government employees, who are demanding hike beyond the pay commission recommendations, the government has so far made no declaration about taking their demand into consideration. Though the Central government employees may be feeling disappointed, it can’t be ruled out that the government may change its stand and provide relief being sought by its staff, especially in view of 2019 general elections. 1. Modi government’s official statement: In an official reply to the Rajya Sabha last month, Union Minister of State for Finance P Radhakrishnan had said Narendra Modi government was not considering a hike in minimum pay beyond the recommendations of 7th pay commission. The minister was replying to a question raised by Samajwadi party MP Neeraj Shekhar. “The minimum pay of Rs 18,000/- p.m. and the fitment factor of 2.57 are based on the specific recommendations of the 7th Central Pay Commission in the light of the relevant factors taken into account by it. Therefore, no change therein is at present under consideration,” the minister had said in his reply. 3. The Central government staff have been demanding a hike in fitment factor from 2.57 times to 3.68 times. The government has not taken the demand into consideration. The ‘All-India LTC’ will, however, be purely optional for railway employees, reads the official circular. Note: The railway staff will not be eligible for “Home Town LTC” and they will have to surrender privilege passes for the year in which they want to get LTC allowance. 4. For the new financial year, Narendra Modi government at the Centre has increased tax-saving gratuity limit to Rs 20 lakh from earlier Rs 10 lakh. Workers in the formal sector becomes eligible for the tax-free gratuity when they leave a job or at the time of their superannuation. Earlier reports had claimed that the 7th Pay recommendations will become effective from April 1. But Central government staff need to wait for the official word. It was expected that the Central government employees may expect a hike in minimum pay from Rs 18,000 to Rs 21,000 and a hike in fitment factor from 3,57 times to 3.00 times of their basic pay. Official confirmation is still awaited. 5. 7th Pay Commission may not be the last commission to make recommendations regarding salaries of Central Government employees. The Centre was reported to be planning to abolish the practice of constituting pay commissions in future. The was also one of the recommendations of the 7th Pay Commission. As an alternative, the Centre may devise a mechanism for the yearly review of Central government staff’s salaries on the basis of the latest price index. As per the statement made by Justice A K Mathur, the Chairman of 7th Pay Commission, the pay matrix of Central government employees can be reviewed and revised periodically, instead of waiting for 10 years to set up the pay panel. Modi government has, however, said that scrapping future pay commissions was not on its agenda for now.